Dating rumors have been swirling around Shawn Mendes and Camila Cabello for years now, and we are finally here to break down their entire relationship once and for all. The singers, who share the cutest moments together, are shipped by many – but it isn’t that simple. There is no doubt there is a sizzling spark between the two, but it’s safe to say these two will simply always just be the best of friends who have nothing but all the love and respect for each other. Are Shawn Mendes and Camila Cabello dating? Shawn and Camila have confirmed on multiple occasions that no, they are not dating – but that doesn’t stop all the speculation. The two were interviewed on The Late Late Show with James Corden back in November of 2015 to promote their hit collab “I Know What You Did Last Summer,” and that (in our opinion) was their funniest attempt at squashing the rumors. James, like many others, was 100% convinced that the two loved each other, and Shawn and Camila naturally got super defensive. Shawn confessed that Camila would always turn him down whenever he leaned in for a kiss – which then resulted in Camila getting all fired up, saying he never even went for it! Plus, they were spotted getting rather cozy while out having pizza together right before the 2018 Grammy Awards, which sent shippers into overdrive yet again. Even though they’re just friends, there is no doubt the two support each other. After Camila announced her exit from Fifth Harmony, Shawn took to Twitter to praise his friend for the way she handled things. They don’t just support each other when the doing gets tough though – they’re always there for one another. Shawn even mentioned that he was teaching her how to play the guitar, and Camila has taught him some Español – all out of the pure kindness of their hearts. Can you even? Oh, and that four letter word that begins with an L? Yeah, we’re talkin’ “love.” They throw that around too. Camila and Shawn legit are always professing their love for each other on Twitter, especially when they’re congratulating the other on an amazing song or performance. OUR HEARTS. But wait, there’s more! Did Shawn Mendes and Camila Cabello ever date? 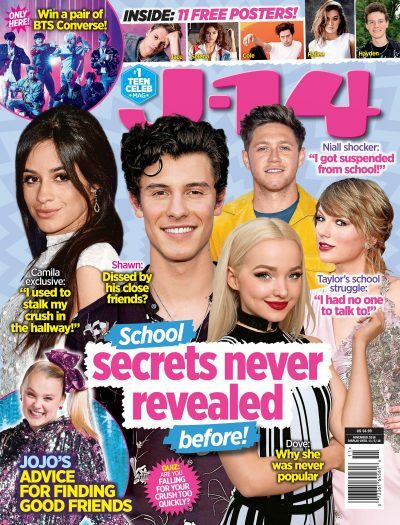 Although Shawn and Camila were never in a romantic relationship (cough, cough – publicly, at least), they have definitely said things that lead us to believe there was a spark there. Never forget the time Shawn said he would “wife up” Camila while playing a game of ‘Lips, Wife, Leave It!’ with Capital FM. “Because I know Camila well, I’d probably wife Camila, lips Chloë, and then I’d have to leave Jade, just because I don’t know her. I’m sorry!” he said, after being given the choices of Camila, Jade Thirlwall of Little Mix and Chloë Grace Moretz. To this day, they’re always caught documenting their time spent together. Who could forget when they bumped into each other at the doctor’s office? It was the selfie that swept the nation, and they’ve never looked more couple-y. Why do people think Shawn Mendes and Camila Cabello are dating? They’re always expressing their love for each other – it’s that simple! Just take her birthday message to Shawn, who is now 20 years old. In one simple tweet, she let the world just how much he will always mean to her and it’s too freakin’ cute. “She has the best sense of humor and she’s probably – other than me – the most determined person I’ve ever met… The next guy that finds her should ‘wife’ her up,” he said. STOP IT SO CUTE. And when Camila’s solo album dropped, Shawn, of course, let everyone know he was “unbelievably proud” of his bud’s tunes on Twitter and she responded back, giving him all the love too. She naturally had a lovely reaction when she was asked about the supportive tweet. “He’s so cute, I love him. It’s so crazy, we never hang out but we’re always texting and always on the phone. We’re never in the same place at the same time but we’re always texting about random stuff. We talk about Harry Potter; I love Shawn, he’s a real friend. I actually sent him my album before it came out, like two weeks before,” she said while on The Zach Sang Show. Ugh these two, the cutest always. Plus, she did say in an interview with ET Canada that her dear pal Shawn is her friend she most likes to party with for the most random reason: they don’t really like parties. “I’m going to have to say Shawn. He’s such an anti-party person and I’m kind of an anti-party person that it just works,” she said. LOL so they bond over the fact that they would much rather be doing something other than going to a party. Another sign of their deep connection. How did Shawn Mendes and Camila Cabello meet? There once was a time when both Shawn and Fifth Harmony went on tour with Austin Mahone. At the time, Camila was dating Austin – so yeah, they did just start out as friends. However, there was some jealousy. “While we were on tour Austin and I were dating and Shawn was just kind of being a loner! Yeah he was so jealous and he couldn’t come out on stage because he was just seething rage and crying blood,” Camila joked. LOL, Camila’s got jokes. But it is true that Shawn would kind of isolate himself on tour. Camila spilled that she barely even saw him when they toured together. While the friends haven’t yet headlined a tour together, but they’d be a dream team if they did! Come on, they already have a song together. It’s a match made in heaven, really. “[Touring together] would be really cool. I actually was going to, and I wanted to, but the thing is, it was for this tour [he’s on] now and my music wasn’t ready because I was [still] in the studio. But that would be amazing because I love him to death,” Camila said in an interview. Cue the aww’s. Only time will tell where their relationship goes from here! All we’re saying is a tour would be lit – and would most likely make them closer then ever. We’re just sayin’.